I don't know exactly what has come over me. You see, I've lived in Alaska since 1986. There, I said it. I live in Alaska. My family moved here at the end of my 3rd grade year and I was terrified. Visions of igloos, penguins, and polar bears haunted my sister and I, who were young enough to be naïve, but still old enough to know we had reason to be afraid. Upon arriving in our motorhome in this vast land of mountains and wide open spaces, we quickly found there were no igloos, no penguins (I should have known that), and no polar bears. At least not in this part of Alaska. This part of Alaska was rather normal and familiar. There were people, houses, cars, stores, and schools. I don't know what I'd expected, but what I found was far from it. And then there's the scenery. Oh, the scenery. I knew back in 1986 that I was living in the middle of something special. Something out of the ordinary and breathtaking. But you would have never caught me admitting that. "Oh, Amanda, aren't the mountains so beautiful?" they'd ask. Every time, I'd answer back, "No. I hate them." I was a stinker. And I knew it, and so did they. But it became this game we'd play. The game of See How Much You Can Annoy Amanda With Beautiful Mountain Talk. But I grew. I grew, and I grew, and I grew. And today? I'm so crazy about this glorious place I live and its vistas, that I can barely stand it. I've become my parents. And every other person who has ever lived here. "Oh, kids! Look at that sunrise. Have you ever seen anything like it?" This fall and so far this winter, I've taken more sunrise and sunset pictures than I think I've ever taken in my entire life. It's like I'm seeing it all for the first time. They're so everyday and ordinary. But then not. I've lived in this house for nearly 10 years, and wonder if I ever noticed before. Why was I missing this? I'm still not sure, exactly. But it's like I'm stepping out of an old, dried-up exoskeleton that needed to be shed for me to see. Life, people, and the world around seems more real, more vibrant. Or maybe I'm getting old or more mature. Or maybe a little of both. I just stepped away a second ago to catch a glimpse of the pink and blue sunset that is commencing. See? I can't be stopped. This picture was taken this morning in all of its unedited glory before we zoomed out the door to Bible Study. The capturing is the remembering. The breath catching in my throat is the thanking. Every morning brings fresh sunrises and new mercies. Praise God for that. Every Tuesday in December, I'll be linking up with the gang over at Chatting with the Sky, as we share the gifts of an ordinary day on Tuesdays Unwrapped. 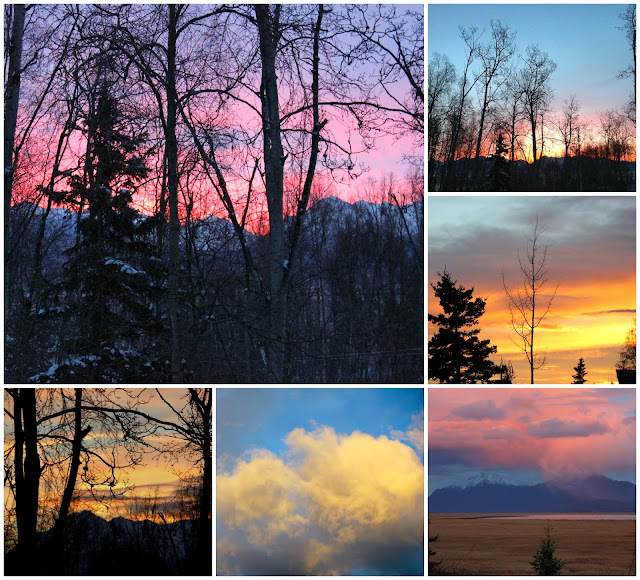 12 comments on "And Now I See"
I take so many photos of sunrises and sunsets, too!! My 20 year old daughter makes fun of me, but I can't stop! God's artistry is so amazingly breathtaking! I live in Iowa, and there are no mountains here, but we do have gorgeous sunsets! Blessings to you! visiting from Chatting at the Sky. God's handiwork is off the charts when it comes to the sun's comings and goings, isn't it? Thank you for coming by! Beautiful pictures and a beautiful family!!!! We adopted our girls from Ethiopia 4 years ago! Wow! Alaska? That's so cool! :) What gorgeous photos! I'm sure they don't even do the sunsets justice. Yes, it's quite the unique place to live!! Those are beautiful pictures. I have a thing for sunset pictures. Thank you! I'm glad I'm not the only one. Absolutely gorgeous! Such a gift...each and every sunrise and sunset. Thanks, Jen. By the way, I popped over to you blog and LOVE the color on you dining room walls and your advent tree! And you should not be stopped. Such beauty. My daddy lived in Alaska for four years before high school--in Anchorage where they would take the camper out to fish and spend the weekend on the Kenai Peninsula. Sometimes my outside life is very narrow (I work at home and other than shuttling the kids, errands, and some runs, my only other outside activity is walking the dog), but mountains and sunsets are big in my narrow slice of life. Everyday they are both different and the same. A marvelous gift.